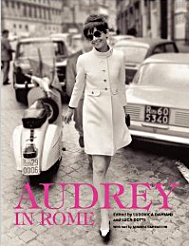 Audrey in Rome, a newly-published book of black and white photos, shows Audrey Hepburn in and around Rome, her favorite city and home for 20 years. You see her, not as an elegant, unapproachable actress, but as a real person going about her days like anyone else. You see her grocery shopping, taking her son to school, walking her dog and other activities--always with the magnificent city of Rome in the background. In addition to everyday photos, there are some photos made on the sets of movies she made during her Rome years—Roman Holiday, War and Peace, The Nun’s Story and Breakfast at Tiffany’s. There is only a very small amount of text in this 192-page book released this past April. The book has an introduction and three chapters representing three decades of her life, the 1950s, 1960s and 1970s. You also learn some about her early life and her hardships as a child during World War II. You’ll discover that she became obsessed with helping children in her later years and this lead her to become UNICEF’s ambassador. Along with the text and photos in the chapters, there are pages scattered throughout the book that focus on the iconic style that was Audrey Hepburn. These pages describe the accessories that were her personal preferences such as large sunglasses, ballet flats, basket purses, scarves and, of course, the little black dress. It took just under four hours for me to read the text and examine the photos. But it is a book that I will want to return to again, probably after I’ve seen one of her fantastic films. It was a wonderful glimpse into her extraordinary life.